Library Trends has published a two-part special issue on information and the body. Within library and information science (LIS), the study of information behavior has traditionally focused on documentary sources of information and to some degree information that is shared through interaction. Such an emphasis reflects the origins of the whole field in the study of the information behavior of users of libraries and other institutions that provide access to encoded forms of knowledge. Yet the centrality of embodied experience in all aspects of human life makes the relative neglect of the body in information behavior studies surprising and potentially problematic, as a number of authors have suggested (Cox, Griffin, and Hartel 2017; Lueg 2014, 2015; Lloyd 2009, 2010, 2014; Olsson, 2010, 2016). 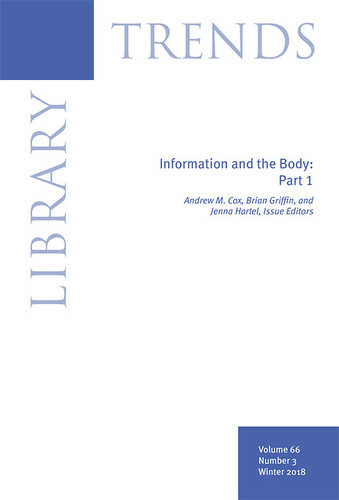 This special double issue of Library Trends on “Information and the Body” brings together researchers interested in embodied information, including in how we receive information through the senses, what the body “knows,” and the way the body is a sign that can be interpreted by others. Last modified Jul 1, 2018.